No More Invisible Women, is an exhibition that showcases the incredible work of the Women’s Committee of ACT UP New York. The featured audio and visual recordings are focused on four actions: the Target City Hall action, and actions which met with three governmental institutions: the CDC, the FDA, and the National Institute of Health (NIH). These excerpts of original video footage and audio recordings bring to light the outstanding achievements of the Women’s Committee and celebrates the efforts and activism that helped accomplish a long overdue justice for women with AIDS. 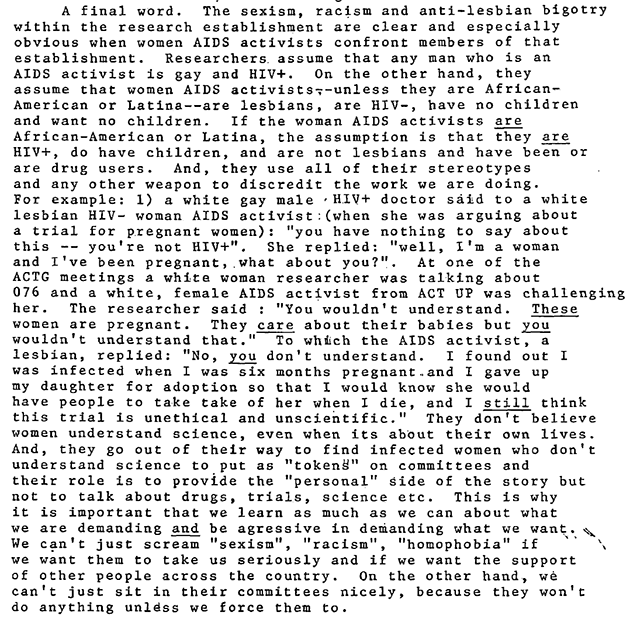 The activists who fought for recognition of women's health issues with regards to AIDS were people of color, women, and PWAs (people with AIDS) working together to get our federal health institutes to prioritize women's health. And it was a difficult, lengthy, and painstaking process, but, in the end, they won. Source: Maxine Wolfe's "A BRIEF (and not complete) History of Women Focused Actions by ACT UP"